Friends of the Chicago River Executive Director Margaret Frisbie says that while there are many signs of an improving waterway, some people still think of it in outdated ways. Appearing on ABC7's "Newsviews" on July 22, Frisbie said that the organization's nearly 40 years of effort has "built an awarenss of this river as a natural resource." "That has really changed people and they support us in efforts to clean up the river," she told reporter Tanja Babich. That mindset change will help lead to a swimmable Chicago River, she said. Using the river as a regular swimming option is "not that far away," she said. Still, "there are some physical barriers but there's also some cultural ones," Frisbie said. "We have a long legacy of using the Chicago River as a dumping ground. We literally named part of it the Sanitary and Ship Canal, so that's not too inspiring when you're talking about swimming. The river is recovering and we ought to change the way we view it." One sign of the improving river: more river otters. "River otters are [a symbol] of a cleaner river. Not only do you have to have fish for them to eat, and mussels and other macroinvertebrates but you also have to have clean water. An otter depends on its coat being very healthy and not disrupted by oil and other pollutants," she said. The reemergence "shows us we are making strides." Frisbie credited the Metropolitan Water Reclamation District's Tunnel and Reservoir Project, aka Deep Tunnel, with reducing by 85 percent the number of releases of untreated water into the Chicago River system after heavy rainfalls. That's not a complete elimination and heavy rainstorms linked to global warming still tax the system "so there is still a problem," she said. More green infrastructure designed to capture water before it gets into the sewage system is necessary as is reducing trash and road salt and conserving water, she said. "Improving water quality takes federal law, it takes state law, it takes county law and it takes city committment. We have to work collectively," she said. Unfortunately, she added, "right now it's hard to get the laws enforced." 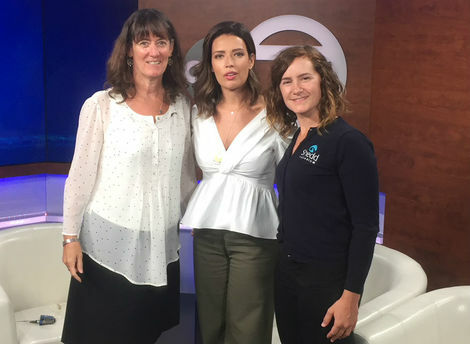 Friends of the Chicago River Executive Director Margaret Frisbie, ABC7 reporter Tanja Babich and Jaclyn Wegner, the Shedd Aquarium's director of conservation action, who also appeared on the program.